Following the successful series of sailing yachts of elegant design that have been built over the years as well as the proven interest that Frauscher's electrically powered craft have been enjoying, the Austrian company now in the lime light as European leader has decided to add to its sales catalogue a series of models geared to be tenders. The tenders,designed in collaboration with George Nissen, feature inboard or outboard petrol or diesel engines and are particularly reliable and manoeuvrable even in the worse meteorological conditions thanks to their innovative keels. The typical somewhat "retro" look that has imprinted the series right from the outset is to be found again in this newer model which is regarded as being the fleet's king pin. The "686 Lido" has a perfect runabout waterline with an original round steering console at mid ship which, aside from its pleasant esthetical look, allows for greater space on board. In fact seat wise, besides the two armchairs next to the driver there is a comfortable sofa astern and two smaller ones at the bows that face each other forming a small saloon. The engine cover is used as a sundeck separating the cockpit from the bathing area which has an integrated diving platform. The standard qualitative version foresees a teak deck and numerous accessories. A specific price list of the optional fittings allows, however, for an ample personalized choice of solutions. Shipyard: Bootswerft Frauscher, Traunsteinstrasse 10/14, 4810 Gmunden (Austria) Tel. +43 (0) 7612636550, fax +43 (0) 76126365511. 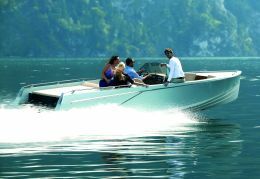 Web: www.frauscherboats.com; email: frauscher@bootswerft.at. Registered CE B; Price with a Steyr Euro 64.010. Vat excluded.